Paint stripping is an important part of wood refinishing. It’s easy to get rid of old paint and finish in order to uncover wood’s natural beauty. Wood that looks black and ugly can often be transformed almost magically by removing the old finish. Often the ugly appearance is entirely on the surface and disappears as soon as the old varnish is removed. Using a chemical paint stripper can be dangerous, you just need follow the following simple paint stripping procedures and stay safe. In order to remove the paint or clear finish, you’ll have to test it to ascertain what type of paint or finish it is and determine the right technique to use. Check out Choosing the Right Paint Stripping Technique for more information. Paint stripping should be done either outside, preferably in the shade, or in a well-ventilated room. Protect the floor and any nearby furniture and wear protective clothing. Doing this will ensure stripping wood stays safe. Wipe up dust from the wood. Remove any attachments such as hinges and door handles. Scrape off all loose material. To protect anything you don’t want to strip, mask it with two layers of tape and paper. 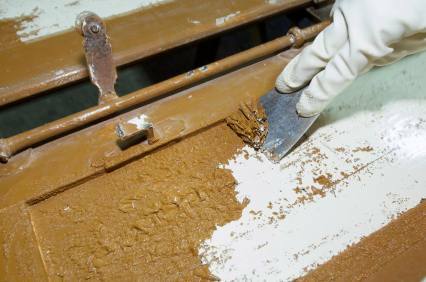 Paint stripper should be applied with a disposable natural fiber brush—the chemicals will eat away at synthetic fibers. Apply the stripper in a thick coat in one direction, using a single movement. Cover with light plastic to prevent evaporation so that the stripper works. This is optional and depends on the chemical paint stripper you use, some might dissolve the plastic. Give the stripper some time to work and remove the finish, though you may need to use multiple coats in some cases. When the finish begins to look wrinkled, it is ready to be removed. Use a wide metal putty knife with rounded corners to remove the stripper and finish without damaging the wood. Steel wool, old toothbrushes, small putty knives or specialty paint scrapers can work for grooves and intricate carvings. Use them to scrape away the finish and paint. Be careful not to dig into the wood. There’s a natural patina that wood develops over time. You don’t want to scrape this layer away. You just want to remove all the old paint or varnish. To completely remove all paint or varnish may require multiple procedures to remove all the finish or paint, especially if you are removing many coats of an old oil-based paint. Be patient. Let the paint stripper do the job, not your elbows. After removing the finish, use a solution to remove the stripper and residue. The manufacturer of the paint stripper will recommend what type of solution to use, but generally water neutralizes water-based strippers and mineral spirits takes care of oil-base strippers. Use steel wool to spread the solvent in strokes with the grain of the wood until paint and finish are gone. Removing paint or wood finish is an intricate procedure. However, once you are done stripping all the old accumulations, the real beauty of your wood will reappear ready for you to refinish.